Does the condemnation of the ‘Three Chapters’ contradict Chalcedon? One of the events of import when looking into Leo the Great’s legacy is the Three Chapters Controversy of the sixth century. Many western bishops and clerics — as well as some of the East — felt that an edict of Justinian condemning ‘Three Chapters’ (544), and the Second Council of Constantinople (553) that approved this edict, undid the work of the Council of Chalcedon (451). As a result, besides writing texts In Defence of the Three Chapters, the opponents of the condemnation put together collections of texts and acts of the Council of Chalcedon to better present their opposition to Justinian (who was likely to depose and exile you if you resisted). But what are the Three Chapters, and do they contravene the Council of Chalcedon? How might this potentially abrogate Chalcedon? Well, the chapter against Theodore of Mopsuestia won’t. It is the chapters against Theodoret and Ibas that pose the problem for most — especially, it seems, against Ibas. Theodoret of Cyrrhus was a tireless critic of Cyril of Alexandria, and wrote a number of dogmatic works, including refutations of Cyrils anti-Nestorian anathemas — anathemas considered essential to orthodoxy in the mid-sixth-century East, whether Miaphysite or Chalcedonian. In fact, the interpretation of Chalcedon produced by the above-quoted letter of Justinian is that Chalcedon approves of Cyril’s anathemas. Theodoret’s anti-Cyrillian activities got him deposed at the Second Council of Ephesus in 449 — the council Leo dubbed a latrocinium, a den of robbers, in a letter to the Empress Pulcheria. At Chalcedon in 451, the actions of Second Ephesus were undone, including the condemnation of Theodoret on the condition that he give assent to the Tome of Leo as orthodoxy and condemn Nestorius. These things he did; there is a chance that he is one of the few people in antiquity who actually changed his mind. Since Theodoret was reconciled to the Church at Chalcedon and reinstated as Bishop of Cyrrhus, it struck the supporters of the Three Chapters that a vague condemnation of his anti-Cyrillian writings was dangerously close to contravening Chalcedon. Ibas of Edessa, on the other hand, appeared at Second Ephesus after having already been tried for heresy, allegedly having said, ‘I do not envy Christ becoming God; what he is, so can I be.’ He was also condemned for having written a letter to ‘Mari’ (which means ‘My Lord’), a Persian; Richard Price reckons that Ibas’ letter was written after 433 when the Antiochene party was reconciled to Cyril of Alexandria to help remove the sting. This letter makes quite clear that before 433, Ibas considered Cyril a heretic. Ibas’ letter to ‘Mari’ was read out at the Council of Chalcedon as part of the acts of Second Ephesus during Ibas’ reconciliation to the church that, as with Theodoret, included the anathematisation of Nestorius and Eutyches. Some of the sixth-century Chalcedonians had become what Richard Price in his introduction to The Acts of the Council of Constantinople of 553 calls ‘conciliar fundamentalists’ — they treated the acts of the ecumenical councils the same way a fundamentalist treats the Bible. As a result, if it’s in the official acts, they believe it is to be accepted wholly and uncritically. However, the acts of Chalcedonian are simply the minutes of what transpired, and they include the acts of Second Ephesus, which Chalcedon actively overturned, as well as statements from various bishops not meant to be taken as binding for the Church. Nonetheless, for such readers, Ibas’ letter to ‘Mari’, a Persian, was a stumbling block when Justinian passed his edict. To others, it was the apparent acceptance of the letter as evidence of Ibas’ orthodoxy by the papal legates and Maximus of Antioch. It is true, the rest of the bishops present did not accept it as such — the most any of them would say was that ‘the documents’ proved his orthodoxy, and that would mean that acts of the synods that tried Ibas, not the letter to ‘Mari’ alone. I do not think that condemning the letter to ‘Mari’ abrogates the Chalcedonian settlement. First, doing so does not condemn Ibas himself post-Chalcedon, for one thing, which was the major issue at the Council. Second, the opinion of most bishops was not positively in favour of this letter — does endorsement by the papal legates mean endorsement by the whole council? Not necessarily. Third, and this is the argument put forward by Justinian, a document so anti-Cyrillian cannot be reconciled with the First Council of Ephesus (431) and the spirit of the Chalcedonian Fathers who approved of two of Cyril’s letters as official doctrine and commended Leo on the basis of his own alleged Cyrillianism. Fourth, when you read the acts of Chalcedon, it is evident that these bishops have little or no interest in reconciling Ibas at all. When the imperial magistrates running the show first ask them if they are willing to readmit Ibas into communion, there is one of the most awkward silences in Church history. No one wanted to do it. They were forced into it by circumstance and the council’s goal of completely overturning Second Ephesus, not by their own will. Interestingly, there is less argument about condemning the vague selection of works by Theodoret. Since his person is left unscathed, and none of those documents made their way into the acts to be adored by conciliar fundamentalists, he is less of a hot topic than Ibas, even though his memory is also more widely regarded. In sum, I don’t think the Three Chapters abrogate Chalcedon. They are, to a degree, in the same spirit as the Chalcedonian Fathers, but adding a stronger Cyrillian emphasis to the doctrine of the church. I do, however, think Justinian was breaking the rules when he tried to enforce them by edict. *Justinian, in writing to the opponents of his condemnation of the Three Chapters, denies that he is making overtures to Miaphysites, but argues that there is a nascent Nestorian resurgence that the edict is countering. That’s false — even non-Nestorian ‘Antiochene’ Christology had long ago entered into critical decline with the Empire years before this. Usually, when people talk about the Desert Fathers and Mothers, they mean those ascetics from the period of St. Antony, St. Pachomius, Evagrius Ponticus, St. Simeon the Stylite, and St? Shenoute. But what about the following generations of desert monasticism? In my mind, the second and third generations of Desert Fathers are those who lived in the sixth and seventh centuries. The sixth century Desert Fathers lived in the era after the Council of Chalcedon, in the days when the Church was drawing ever closer to fragmentation over Christological issues. They also live in the age of the Second Origenist Controversy, which resulted in a list of anathemas against certain “Origenist” teachings (available here) associated with the Fifth Ecumenical Council at Constantinople in 553. The result of the Second Origenist Controversy, which was, as seems likely now, a battle between a more “intellectualist”, contemplative (hesychastic?) strain of monasticism and a more “practical” strain focussed on ascetic labours and “simplicity”, was the destruction of a large amount of valuable material by Origen, Evagrius Ponticus, and Didymus the Blind — although some survives in Latin or Syriac translations, other material circulated under false names, and still other stuff survived out of sheer obstinacy and the fact that a lot of monks really dug Evagrian spirituality — even if they rejected the theological system of the Kephalaia Gnostica. Another result was the banishment of large numbers of “Origenist” monks from Palestinian monasteries. The Evagrian-Origenist legacy would continue, but with less clear force and never unambiguously — the tension between praktike and theoria would never be resolved in Desert monasticism. The sixth-century Desert Fathers also saw some good things. This is the Age of Justinian, which included the foundation of St. Catherine’s monastery in Sinai. This is also the age following the gathering and disseminating of collections of the Sayings of the Desert Fathers, mostly from those first generation monks of the fourth and fifth centuries. The Sayings, or Apophthegmata, were so popular that not only do they exist in various Greek collections and in Latin translation, there are translations of the collections into Armenian, Coptic, Syriac, Georgian, Arabic, and probably even Ethiopian. Sixth-century monasticism flourished in Palestine, both in Gaza and the Judean Desert. Desert Fathers include Dorotheos of Gaza, whose spiritual works are considered by Eric P. Wheeler who translated them for Cistercian as Discourses and Sayings to be an easier introduction to the Desert tradition than the Sayings and the hagiography. Also of interest are Dorotheos’ teachers, Barsanuphius and John, a selection of whose letters has been translated by SVS Press for their Popular Patristics Series. St. Savvas also lived in the sixth century, although he began his work in the fifth. Savvas was the great expander of Palestinian monasticism, primarily in the form of “lauras” communities of monks who lived in separate cells together but only gathered on the weekend. He was a defender of Chalcedon against the anti-Chalcedonians and made embassies to Emperors Anastasius and Justinian on the behalf of Palestinian monks. Parallel to St. Savvas is St. Theodosius, his comrade, who did much the same things as he only for coenobitic monasticism — monasteries as we imagine them, with a full, common life. Important for our knowledge of Palestinian monasticism is sixth-century writer Cyril of Scythopolis, who wrote seven Lives of Palestinian monastic leaders, covering Euthymius, Savvas, Kyriakos, John the Hesychast, Theodosius, Theognius, and Avraamius. He is also our most important source for the Second Origenist Controversy. The seventh century saw the continuation of the Desert tradition. In the Sinai, at St. Catherine’s, John Climacus (saint of the week here) was the abbot and produced his famous Ladder. He himself shared in the inheritance from the Fathers of Gaza as well as from the Evagrian spiritual system. St. Catherine’s was one of the most important foundations of the later generations of Desert monasticism, and it is in her libraries that many Syriac manuscripts have been found, and from here come several of the authors within the Philokalia. The seventh century is also the century of St. Theodoros the Great Ascetic, who lived in St. Savvas’ Great Laura in Palestine and is one of the spiritual masters to make his way into the Philokalia. 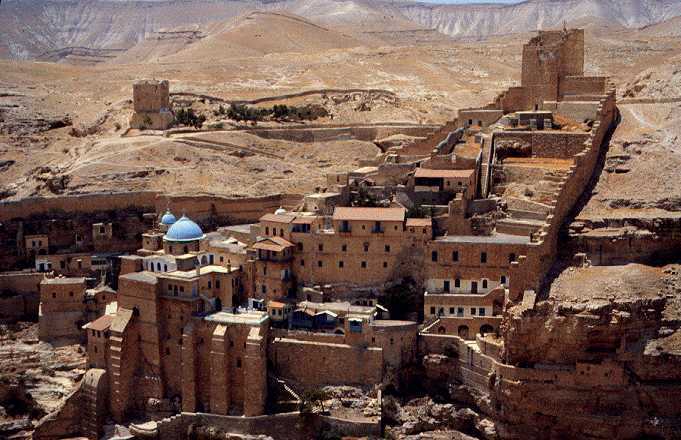 However, by the seventh century, the monasticism of the Desert had lost some of her impetus, no doubt due to the ongoing disputes between the Chalcedonian imperial church and the anti-Chalcedonians, who by this stage had formed a separate church in Syria through the efforts of Jacob Baradaeus and were well on the road to schism in Egypt. As well, this is the century of the exhausting wars between the Empire and Persia which affected the Syrian and Palestinian heartland of Desert monasticism. Finally, the seventh century is the century of the Arab invasions, through which the Desert was lost to the Christian Empire. The legacy of the Desert Fathers and the outgrowth of monasticism in the sixth century is still impressive, however. Their spiritual heritage is found in St. John Climacus’ contemporary, the ascetic spiritual theologian St. Maximus the Confessor, and Syrian asceticism found new life in the last Church Father, St. John of Damascus. But the centre of gravity for Christian monasticism had shifted from Syria and Palestine to Athos and Constantinople for the Chalcedonian Greeks, but also East to Armenia and South back to Egypt and into Ethiopia. Barsanuphius and John. Letters from the Desert. Trans. John Chryssavgis. SVS Press. The Fathers of the Church series has also issued the entire corpus of lettes in two volumes (corrected from earlier today when I said it was ACW). Cyril of Scythopolis. Lives of the Monks of Palestine. Trans. EM Price, introduction and notes by J Binns. Cistercian Publications. Dorotheos of Gaza. Discourses and Sayings. Trans. Eric P. Wheeler. Cistercian. John Climacus. The Ladder of Divine Ascent. Trans. Colm Luibhead and Norman Russell. Classics of Western Spirituality: Paulist Press. The Philokalia, vol. 2. Trans. GEH Palmer, Philip Sherrard, and Kallistos Ware. This volume contains St. Theodoros the Great Ascetic, St. Maximus the Confessor, St. Thalassios the Libyan, St. John of Damascus, A Discourse on Abba Philimon, and St. Theognostos. Hirschfeld, Yizhar. The Judean Desert Monasteries in the Byzantine Period. This book covers the archaeological remains of the multitude of monasteries in the Judean Desert at this time as well as the daily life of the monks. Hombergen, Daniel. The Second Origenist Controversy. This is a highly technical book — in fact, a PhD dissertation — and not for the faint of heart. However, it deals with a lot of the issues in Desert monasticism leading up the Second Origenist Controversy and seeks to uncover what, exactly, the controversy was really about. Maas, Michael, ed. The Cambridge Companion to the Age of Justinian. This book includes a section on the religious and philosophical situation in Justinian’s reign. I would like to include Derwas J. Chitty’s The Desert a City, but I can’t, because I don’t recommend books I haven’t read, no matter how highly recommended by others! Or, if they are heretics, it is for being schismatics, as under Jacob Baradaeus who consecrated John of Ephesus Bp of Ephesus which already had its own bishop. That must have been awkward. John claims Jacob maintained the canons of Nicaea, but this does not sit with the fact that he created bishops for places that already had bishops. But Monophysites are not the heretics you think they are. Chances are, if you’ve heard of the Monophysites, you thought of them as people who believed that Jesus had one nature, and that nature was divine. Or that in Jesus’ single nature the divine was so powerful it completely subsumed his human nature, rendering it useless. Or that Jesus’ divine and human natures were confused with each other. Or that Jesus had a glorified body through his whole life on earth and, as a result, never suffered. Each of those statements is a heresy, and each of them is a Monophysite heresy. But none of them is mainstream Monophysism as represented by Severus of Antioch, Philoxenus of Mabbug, Empress Theodora, John of Ephesus, et al. Mainstream Monophysism is a highly conservative reading of Cyril of Alexandria that refuses to affirm the Council of Chalcedon on the grounds that its Christological formula “in two natures” divides the person of Christ and you effectively have two sons and two Christs, which is Nestorianism. The rallying cry of the Monophysites is the statement of Cyril: mia physis tou theou logou sesarkmomene — one incarnate nature of God the Word. Since Chalcedon affirmed two natures, it was a posthumous betrayal of St. Cyril, according to the Monophysites. Monophysites such as Severus of Antioch believed that Christ was fully God and fully man, possessing all of the attributes of Godhead and manhood within the single theandric (God-mannish) union. This union was a complete union within his person, or hypostasis — thus, hypostatic union. Now, people don’t fight about nothing. Well, sometimes they do, but usually they don’t. There was a real, substantial difference between them and the original Chalcedonians. The sad reality for the Monophysites, though, is that by the Second Council of Constantinople in 553, called by Emperor Justinian, the Chalcedonians had so interpreted and reinterpreted Chalcedon such that it could by understood by a highly Cyrillian thinker — so-called “Neo-Chalcedonianism”. But it was too late. The seeds of schism were sown. And to this day, the “Syrian” Orthodox, Armenian Orthodox, Coptic Orthodox, and Ethiopian Orthodox are out of communion with us, despite joint statements on Christology. This is a sad reality, and one that should be remedied. Would that we had the grace to sit down together and work out the centuries of trouble! I have been reading Origen’s On First Principles recently, and a thought came to me which had come to me before (you can thank me for being suitably vague later). This newly-recurring thought is that Origen and “Origenism” are the formative source and root for Christian controversy and Orthodoxy. Now, you’re probably going to tell me that it’s actually biblical interpretation, such as the interrelation of Proverbs 8:22 with John 1. And you’d be right. But whose biblical interpretation do you think everyone was arguing about? Case Two: Pneumatomachianism (aka Macedonianism, literally “Spirit-fighter-ism“). Origen’s theology of the Holy Spirit is relatively undeveloped, in my opinion. When, in On First Principles, he comes to discussing the Spirit, he gets himself sidetracked with a discussion about spirit more broadly. He once again has a subordinationist view, saying that the Father’s being overflows into the Son who overflows into the Spirit. The Spirit at times feels more like a personification of spirit, not necessarily a self-subsisting person or hypostasis. This ambiguity of the treatment of the Third Person of the Holy Trinity ended up with Origenists such as the Pneumatomachians arguing against the Spirit’s divinity and other Origenists such as Didymus the Blind in On the Holy Spirit arguing for the Spirit’s divinity. Case Three: The First Origenist Controversy. This controversy was specifically about Origen and some of his less … mainline … teachings and his approach to Sacred Scripture; some people (Epiphanius of Salamis, Jerome) were certain that he was an out-and-out heretic and deserved condemnation, and that his allegorical interpretations went too far. Others (John Chrysostom, John Cassian, Rufinus of Aquileia) argued that Origen was largely orthodox. In the heat of it all, Chrysostom ended up dead, Rufinus and Jerome ruined their friendship, and the golden age of Egyptian monasticism was gone forever. His defenders found precisely where he was worth fighting for, and his opponents found the places where he was worth attacking. What constitutes orthodoxy was, as a result, more clearly defined, but, thanks, in the West at least, largely to Rufinus’ translations of Origen and John Cassian’s work in Gaul, allegorical readings of Scripture were never fully lost. Case Four: The Cappadocian Fathers. Gregory Thaumaturgus was a student of Origen, and the Cappadocians (Basil the Great, Gregory of Nazianzus, and Gregory of Nyssa) were students of Thaumaturgus. They were also involved in the later stages of both the Arian and Pneumatomachian Controversies. Gregory of Nyssa was able to produce theological writings after the triumph of Nicene Orthodoxy in 381. Within the bounds of the Niceno-Constantinopolitan understanding of the Trinity, these three Orthodox Fathers par excellence produced Trinitarian theology that follows the trajectory set out by Origen. Origen, unlike his Platonist predecessors, rooted the being of God (His ontology) in being a Father, not in being a Creator. This meant that there never was a time when the Father lacked the Son. It also meant that the Godhead is a distinct being from creation who depends not at all upon the created order. It also means that the very root and source of the universe is rooted in communion (see John Zizioulas, Being As Communion to have your mind blown on this count). These were points taken up by Athanasius, but their nuances were really explored and set forth for us by the Cappadocians. Case Five: The Second Origenist Controversy. This was a controversy about a number of Origen’s cosmological statements that were being espoused by a group of “fanatical” Palestinian monks. In 553, in meetings before the Fifth Ecumenical Council (Constantinople II), Justinian and the Fathers determined that certain Origenist statements were outside the bounds of orthodoxy, and in the Acts of the Council itself, Origen and Evagrius are condemned outright as heretics. This meant that such teachings as celestial bodies having souls or apocatastasis (seriously, get into Patristics for the awesome terminology) which teaches that at the end of all things God will reconcile all rational beings to Himself (presumably the Devil as well — Evagrius certainly thinks so) — such teachings are officially outside of orthodoxy. It also means that very few of Origen’s writings survive, and far fewer of Evagrius Ponticus’ — although one of his writings survived under St. Basil the Great’s name, another under Nilus. People will circulate what they wish, no matter how many books you burn. In the end, so many of the big controversies of the early centuries of Christianity revolved around Origen, his understanding of Scripture and of God, and the Church’s understanding of Origen. He’s not exactly one of the early Christian theologians for one to start with, but he’s definitely worth reading, and certainly important.